AJ rear-facing in the Sunshine Kids Radian at 2 years, 8 months. AJ is 36 inches tall and weighs 32 lbs. MOM'S NOTES: AJ was turned forward-facing at 11 months and 23 lbs because he and I were going on an 8 hour trip alone and I thought this would be easier. He was happy so we never turned him back. 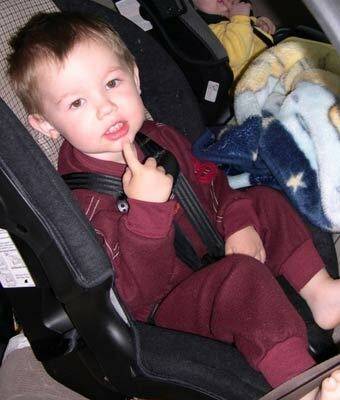 I learned more about car safety and decided to turn him back rear-facing at almost 28 months and 30.5 lbs (35 inches). 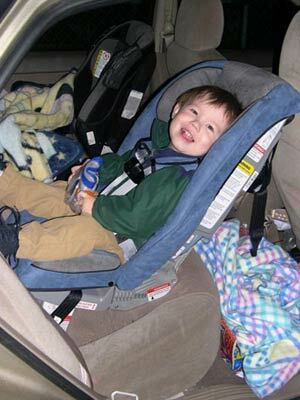 He's now in his brother's Cosco Alpha Omega because he wanted to be, but he can now be rear-facing till 35 lbs! UPDATE: AJ is now forward-facing though b/c he hit 34lbs at 33 months. AJ rear-facing in the Cosco Scenera at 2 years, 6 months. AJ is 35 inches tall and weighs 31 lbs. The Cosco Scenera allows rear-facing to 35 lbs.